When circumstance tears her away from her first loving foster family, Gilly is determined never to be hurt like that again. Over the years, she wreaks havoc wherever she is moved in the hope the authorities will eventually reunite her with her long forgotten mother. Gilly clings to an old photo and the occasional postcard her mother sends. By the time Gilly is a smart-mouthed twelve-year-old, her social worker is running out of options. Enter Maime Trotter, a hippopotamus of a woman with a huge heart, William Ernest, a nervous rabbit of a boy and Mr Randolf, the blind, coloured neighbour who comes to tea each night. Try as she might, Gilly can’t help being gradually drawn into their circle. As she fights against falling into the trap of caring, Gilly writes a letter that changes her future irrevocably. She only realises her mistake when it is too late. 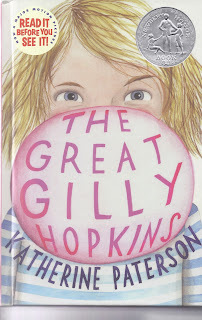 The Great Gilly Hopkins is one of those rare middle readers that reaches beyond the requirement of simple sentence structure and every day vocabulary and fills the pages with three dimensional characters, action and heart. Even though Gilly is an overbearing monster at the start, I couldn’t help falling in love with her. The Great Gilly Hopkins is a classic, right up there with Because of Winn Dixie, The Bridge to Terabithia and Inside Out and Back Again. Soon to debut as a full-length movie, the themes in The Great Gilly Hopkins are as relevant and heart-rending today as they were more than 35 years ago.